Easter may be over, but one thing probably remains — leftover colored hard-boiled eggs. I actually haven’t participated in this Easter tradition for a number of years now (this year included), so did not have any occupying my fridge. Instead, I opted to hard-boil a half dozen just for this recipe. For those of you with leftovers, you’re already ahead of the game. Unlike traditional egg salad, this one uses avocado as a base instead of mayo. Now, I have nothing against mayo if it’s high-quality — either homemade with avocado oil (macadamia nut oil is delicious too) or Primal Kitchen brand in a pinch, but wanted to mix things up for this recipe. Plus, I know there are some people out there that actually don’t like mayo — crazy, I know! But, avocado is amazing and has quite the following as well. In terms of spices, I had to go with a curry theme. I’ve been really into those flavors lately and knew it would be awesome for egg salad. So, there’s curry powder, turmeric, fresh ginger, and fresh cilantro in the mix — among other things. It’s fresh, flavorful, and has a wonderful chunky texture. 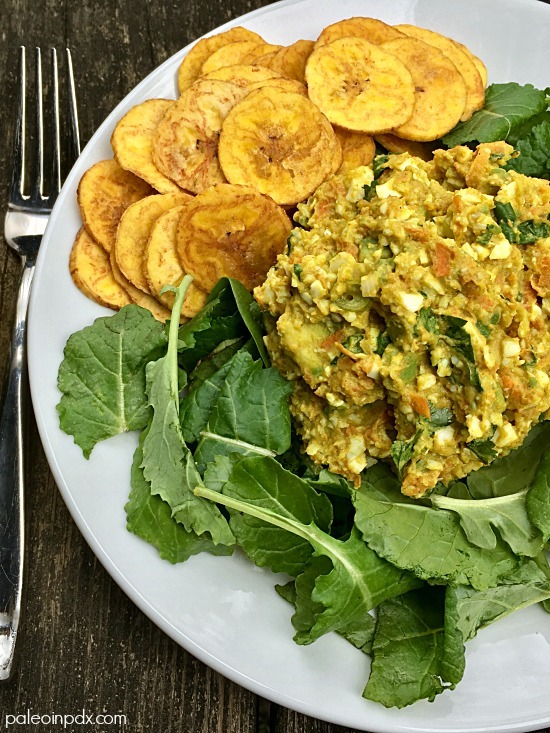 I like it mixed into baby greens with a side of plantain chips, but there are many other ways to eat it. Choose your vehicle wisely! On another note, I’ll be back on KATU Afternoon Live next Tuesday, April 10 and will be making my mighty green chicken salad. Stay tuned! Place avocado quarters in a large bowl with the lemon juice and coconut aminos, and coarsely mash with a fork. Leave some chunks of avocado, if you like. Then, add the peeled hard-boiled eggs, and use a fork and knife to cut the eggs into the avocado mixture. One eggs are coarsely chopped and stirred into the mixture, add the carrot, fresh ginger, curry powder, turmeric, granulated garlic, sea salt and black pepper. Mix well with a fork. Lastly, stir in the green onion and cilantro. Taste and adjust seasonings, if desired. Serve over mixed greens, in a lettuce wrap or grain-free tortilla, or with sliced veggies and/or plantain chips.